Introducing your new favorite baked good. Bonus: It has kale in it! If you have friends in Portland, Maine, you've probably heard about Tandem Coffee and Bakery. Not only is it turning out some of the most delicious baked goods I've ever tasted, it's also one of the coolest-looking coffee shops around. Walk past Tandem and you just might miss it. It's housed in what used to be a laudromat, and before that, a gas station, on a quiet and unassuming street. The front wall of the bakery is all windows, making the clean white interior even brighter. It's cheery, comforting, and decidedly modern in style. Bits and pieces of the building's history still crop up: The sign from the old gas station (called Brakes & Shocks) hangs in the window. 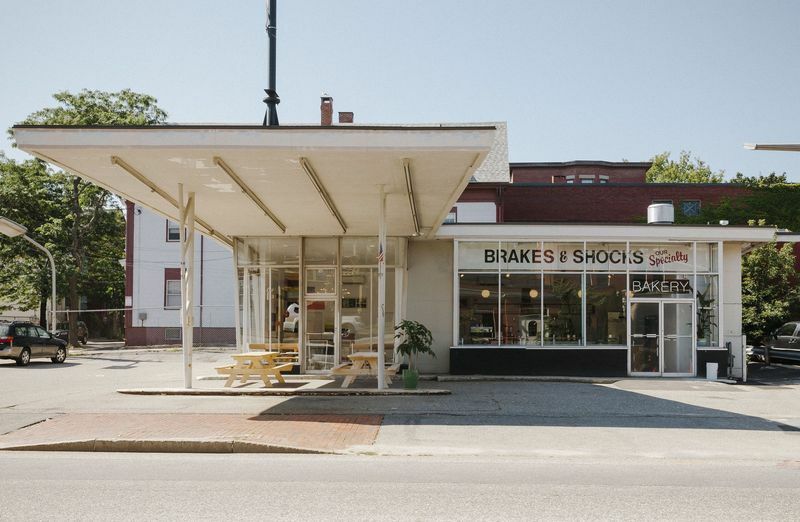 An overhang out front that used to shelter gas pumps now acts as a roof for outdoor seating. Opened in August 2012, Tandem is both a destination for excellent coffee and extraordinary baked goods. 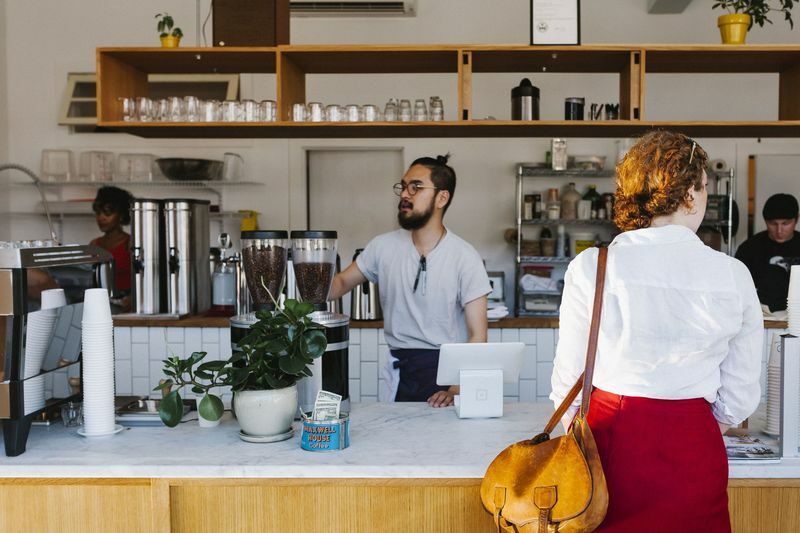 The owners, Will and Kathleen Pratt, are veterans of the coffee industry, most recently working for Blue Bottle in San Francisco and Brooklyn. They had a longtime dream of opening their own shop, but needed some baking brilliance to go alongside the coffee. Enter Briana Holt: a friend and baker they'd met while living on Martha's Vineyard. Together, they decided to move to Portland and open Tandem. But why Portland? For Kathleen and Will, this pretty Maine city has pieces of all the places they've lived and loved: the rough coastal environment of San Francisco, the small-town feeling of Martha's Vineyard, and the fantastic food culture of Brooklyn. Briana has total freedom over the baking menu, and her style is evident in every bite. She pairs classic American recipes with creative, fun ingredients in baked goods like plum pie in a black pepper and cornmeal crust and black sesame banana bread. But my favorite thing to order is the kale scone. Sweet and savory all at once, it's fantastically flaky and loaded with toasted pine nuts, salty pecorino, and tender kale. And since it's full of greens, I consider it tantamount to eating a salad (and you should too). Luckily, Briana was willing to share the recipe with us so that we can all experience Tandem at home. But if you're in Portland, go try the real thing! I promise you'll be happier for having done so. A few notes on the recipe: Quantities are in both weight and volume, but I strongly suggest you use a scale and weigh your ingredients. Most professional bakers do, and with good reason. Not only is it far more precise, but it's a real timesaver. Instead of measuring each ingredient, you can just add them all to one bowl, taring your scale (re-setting it back to zero) as you go. Don't let the amount of sugar make you nervous. Briana explained to me that scones and biscuits require sugar to keep them moist and not leaden and dry. The resulting scone is a tiny bit sweet—just enough to pull it back from being entirely savory and to make you want another bite (and another, and another). We want to know about your favorite dishes across the country! Email [email protected] to tell us about the blueberrry muffin at your local Brooklyn coffee shop, the rack of lamb you had on vacation in Arizona, or the pizza you grew up eating in Chicago. We'll track down the recipe and share it here! Also, their chocolate chip cookies and fully loaded biscuits are fantastic. We spent a week at an airbnb a block away from Tandem and made sure to stop in and visit every day. Yum.